Wise Memory Optimizer 3.63.107 Portable » TopFreeSoft.Net - Best Freeware Software! 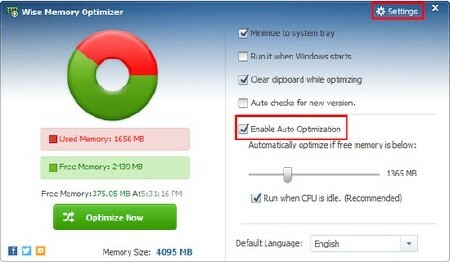 Wise Memory Optimizer is a free memory optimization tool. With the exclusive memory defrag technology, it can help you clean up memory, thus making the applications run faster. Most PC users have known and unknown applications running in the background that take up your computer? ?™s physical memory and thereby affect its performance. Wise Memory Optimizer helps you free up and tune up the physical memory taken up by some useless applications to boost PC performance.